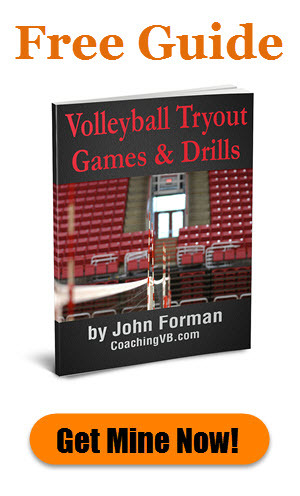 Good drills to get a setter to stop being so lazy? She will call help on so many balls that I know she can get to, she just doesn’t bother trying. And she ALWAYS sets with her forearms instead of using her hands when she can take one more step and use her hands. I rip my setter a new one when she calls for help. So the “train someone else” and “she shouldn’t be a setter” comments were probably very unrealistic options in this case. Benching may or may not have been an option, depending on a number of factors. 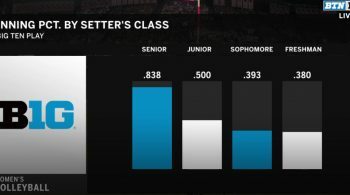 It’s also worth noting that despite how people answered the question, the coach didn’t ask, “How do I deal with a lazy setter?” Instead, she was basically asking, “How can I train my setter to be less lazy?” The difference may be subtle, but it’s important. I might even say “lazy” isn’t the right way to put it. Sounded like some confidence building was required. I seriously doubt ripping the kid was going to be the best way to go. Regardless, the poster was asking for some suggestions on what she could do to train this player. Now, a lot of coaches think a new drill or game can fix a problem with their team. That’s rarely the case. They don’t realize the main issue is having the right focus and incentives (or disincentives). That’s why I didn’t suggest a specific drill or game, but rather a scoring approach. I recommended only counting repetitions or points (or whatever) when the setter set the second ball with her hands. 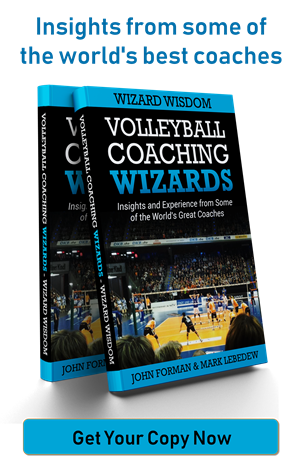 Not only does this serve the purpose of encouraging the setter to be aggressive in running balls down and not playing them with their forearms, it also serves to encourage the passers and/or defenders to play balls more accurately and/or higher. Two drills I have used quite often over the years where this comes into play are the Hard Drill and the Cooperative Cross-Court Hitting drill. (or the rotating version). In each I only count good reps if the hitter legitimately attacks and the setter sets the resulting dig with their hands. Believe me! 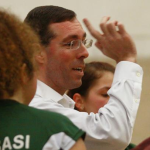 When it’s the difference between being able to finish a challenging drill or not, the players are right there to remind the setter to take the ball with their hands. This principle can be applied anywhere you have a pass/dig-set-attack sequence. And it works for encouraging jump setting as well! 4 replies to "How to get a setter to go for the ball and use their hands"
Really simple answer. Setters’ Rules. No arguments, no shouting, no calling ‘help’. btw what does ‘help’ even mean? I’m having a heart attack? I’m drowning? I can’t find my keys? Rules are fine, but by what mechanism are they encouraged or enforced? Love this post! I as well was concerned with the response to the inquiry. My belief is many i experienced coaches are only reacting to the situation. I bet they are the same way eduri g a match. I am sure you saw my response as to question if the situation was a behavior or a skill set issue. ‘Lazy is a behavior’ and drills in your opinion addresses skill sets and techniques. Sure your drills mentioned in this blog can address parts of the behavior, but what would you do about the ‘lazy’ behavior. Me, I call it as I see it. We will sit down and address how much the effort level effects the team and what we want to accomplish. I also would have the athlete take ownership of her own effort level. If any athlete cannot take ownership of his/her own improvement, they will be not be helping the team. I would then address letting the athlete find another activity besides my team. To my mind, the player is going to “get it” with respect to their laziness negatively impacting the team (assuming lazy behavior is the issue) more quickly and with greater impact if there is the immediate feedback mechanism of their team losing points or not getting credit for a rep than a coach sitting them down for a talk. I’m not saying the talk isn’t worth doing, and for certain players it may be enough. I’m just saying the feedback mechanism of drill/game consequences will probably have a large influence on behavior.